Cole Haan Elsie Cap Toe Wedge Pump Womens 8 Black Leather/Patent Ballet D41737. Condition is Pre-owned. Shipped with USPS Priority Mail. Marks on the bottoms of soles; Inner lining by toes on right shoe is torn; this can easily be fixed. Coach Black Leather Peep Toe Heeled Wedge (Size 8.5). In fantastic preowned condition with very minimal signs of usual wear. Low Heels 1 1/4" High - Heels are patent leather. Beautifully crafted shoes, with leather uppers, and leather lining and inner sole. We want to ensure our service levels are as high as your expectations from us. Color - Red. SEE PICTURES FOR VISUAL CONDITION & CONDITION OF SOLE (USE ZOOM). A New Approach, 8.5 M, Silver, Portia, Low 1" Wedge Heel, Flats, Slip-On, Shoes. Michael Kors Damita Wedge Canvas Black Espradrille Women's sizes 6-11/NEW!!! Prada Leather Buckle Strappy Cork Shoes Wedges Sandals EUR 39 (US 8.5). Condition is Pre-owned. Shipped with USPS Retail Ground. Heels have wear as pictured. Length (Heel To Toe): 9.25". Insole Length: 10.25". Heel: 2.75". Width: 3.5". Dirt stains and scuff marks on toes, sides, and back heels. Bottom soles are dirty with normal wear to treads. Scent - My items come from a variety of sources. I do not smoke nor does anyone in my home but I cannot guarantee that an item has never been in an environment that someone may have smoked in. I use scented laundry detergent. Sometimes items may have a scent. Perfume, wrinkle releaser, fabric softener. Some consignment stores have taken to pumping fragrance throughout their stores, which may cause a faint scent on items I purchase from them. I do not guarantee that items will be free from any scent. If you are sensitive or allergic, you might want to consider this. AETREX WOMEN'S RENEE LEATHER/FABRIC LOW WEDGE SHOES - NWOB - CLASSY NEW SHOES! GREAT CONDITION WITH BOX. WORN ONCE. Liz & Co. ladies beautiful Lorna navy patent leather wedge open toe with white trim and heel they were worn twice and are in excellent clean condition. perfect for the office. 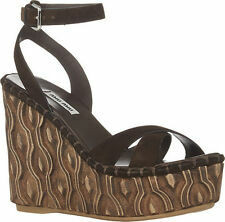 Women’s Frye wedges size medium 81/2. Worn once. See pictures. Look over carefully before buying no returns. Use at your own risk. Every item is described to the best of our ability. These are in great pre-owned condition. 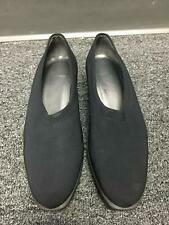 Up for sale is a beautiful pair of Cole Haan Nike Air Black wedge ballet heels, size 8.5 or 39 euro. These shoes are in excellent pre owned condition with very light wear. Cork Heal Open Toe. Size 8.5 Patent Leather. Size: 8-8.5 US, 39 EU. as possible and to our best ability. Pre-owned: Used with signs of wear. Ralph Lauren Womens Gray Patent Leather Wedge Size 8.5 M Mery Jane Insole toe to heel 9 3/4 inches 2 3/4 inches width New Display shoes no box included. Please see pictures as part of description. Email me if you have any questions. Thanks for looking. 2.75" heel. When you are finished, you can check out. view the pics!